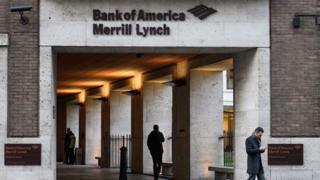 The UK's financial regulator has fined Bank of America's Merrill Lynch £35m for breaking reporting rules. The US bank failed to report nearly 69 million transactions over two years, the Financial Conduct Authority said. Merrill Lynch's fine was reduced by 30% because the bank agreed to settle at an early stage, the regulator added. The bank said it had reported the issue as soon as it was discovered and was "wholly committed" to following financial regulations. It is the first enforcement action taken by the regulator under rules introduced following the financial crisis of 2008. The types of trades involved, known as derivatives, can create a "complex web of interdependence" that then make it difficult to identify risks, according to the watchdog. Merrill Lynch said it had alerted authorities that it had failed to report the financial trades between February 2014 and February 2016. Mark Steward, the FCA's head of enforcement, said firms needed to ensure their reporting systems worked properly. "There needs to be a line in the sand. We will continue to take appropriate action against any firm that fails to meet requirements," he said. A spokesperson for the bank said it had improved its systems and that no clients were affected financially. Earlier this month, Bank of America Merrill Lynch reported a 13% increase in net profits to $5.6bn (£4.2bn) for the three months to September.